Blue is the color of sadness as well as the color of the sky and both things are making us feel overwhelmed: the first because of the weight of our contradictions and the second because we feel the beauty and the vastity of the nature and we feel small in front all this. 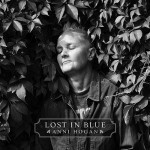 I read “Lost In Blue”, the latest Anni Hogan album produced by Dave Ball and Riccardo Mulhall, as the tale of lost souls which wander taking life as it comes: sometimes there are sparkles of joy which explode like a baby’s smile, sometimes moments of doubt and if you’re lucky there won’t be many of despair. In this album Anni is like the owner of a cabaret where people is coming in to share their experiences. Lydia Lunch, Wolfgang Flür (ex Kraftwerk member), Gavin Friday (formerly of Virgin Prunes), Richard Strange (Doctors Of Madness), Kid Congo Powers (of The Gun Club, Nick Cave & The Bad Seeds andThe Cramps fame), Celine Hispiche, Scarlet West and John Fiddler are coming in, enjoining Anni while she’s playing her piano with an orchestra. They are walking to the mic like their they’re going to unload the weight of their lives by telling everything to a friend and they let themselves be carried away by the mood created by the music. Just to give you a precise idea, here’s what the label’s presentation is writing: “…dark cabaret and modern vaudeville, with Anni’s trademark torch songs evoking the dimly-lit corners of bohemian Soho and reigniting the sordid torment of those illustrious Marc & The Mambas days”. Anni is also singing some songs, joining her guests with the same sensibility they showed. The album has been released on CD (having a bonus track sung by Wolfgang Flür), blue and black vinyl. For the occasion four video have been released for “Blue Contempt” featuring Lydia Lunch, “Thunderstruck”, “Ghosts Of Soho” featuring Celine Hispiche and “Angels Of Romance” featuring Gavin Friday. Lost but not damned!